The reactive programming paradigm has swept deep through the landscape of our industry, transforming—and continuing to transform—it for the better. This paradigm shift is, IMHO, right up there with when object-oriented programming appeared on the scene, back in the eighties. Functional programming, of course, continued to make steady progress, all the while, making increasingly wider and deeper forays into the thicket of the programming industry, cutting through swathes of complexity, gaining mindshare, and becoming mainstream in the past few years. And here we are, witnessing the blossoming of another paradigm, as reactive programming paradigm has shifted our mindset by going mainstream. 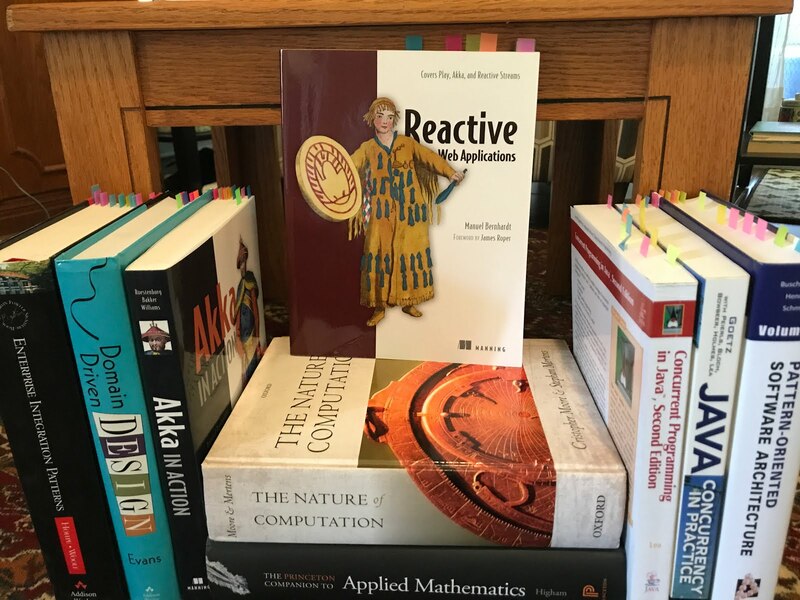 To help guide newcomers through the landscape of the reactive programming paradigm, I share, in this essay, my take on the very best (book-format) resources available. My hope in doing so—and I have spent serious time grappling with the material in each book—is that you, too, will be equipped thereby to design systems that are Responsive, Resilient, Elastic and Message Driven. Allow me, though, to first ask: Is your favorite reactive programming book(s) missing from this list? If so, please post your comments on this blog so I can include your book(s) in the sequel of this review; I’ve reviewed only a subset of the burgeoning number of fine books that have been written—and continue to be written—on this intriguing subject. I hasten to add that online resources remain indispensable and fantastic in their own right, especially for keeping up with leading edge updates. But what about times when you simply want to sit down and really absorb the wisdom of our reactive design sages—the underlying conceptual constructs that power the design of next generation software—in a more sustained and methodical way? And that is where the resources, which I review in this essay, come in. Before moving on to the reviews themselves, I wish to underscore that my liberal references to mathematics are not random; as a computer scientist, I have deep and abiding respect for the power of mathematical thinking. Consider that Turing himself was a mathematician, of the highest order. That brings me to the symbiosis, as it were, of functional programming (FP) and object-oriented programming (OOP). And FP is firmly grounded in mathematics, giving us new—or, more precisely, newly-gone-mainstream—ways of reasoning about software design and code. 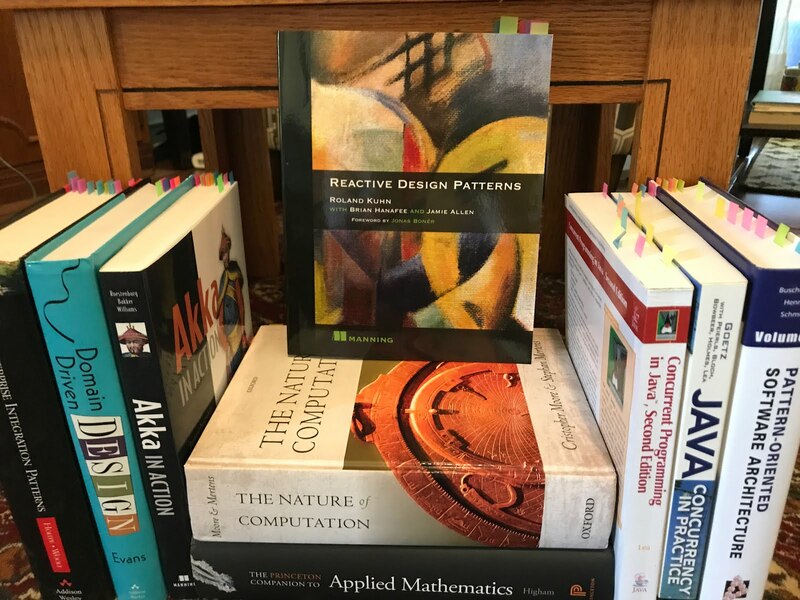 If you’re looking for the best-written, most-comprehensive treatment of reactive design, look no further than Reactive Design Patterns by Roland Kuhn, Brian Hanafee, and Jamie Allen (Manning Publications). The contents of this book are overwhelming—in a good way—as there is so much that is of such high quality: the caliber of writing, the sparkling-clear illustrations, and the stellar code snippets. I cannot think of a better book from which to learn the reactive programming landscape than this amazing volume. Here is a link to the book’s accompanying code, available freely on Github. Allow me to introduce a book that is almost lyrical in the beauty and elegance with which it tackles an incredibly tough subject, actually three whole subjects, to be precise: Functional and Reactive Domain Modeling by Debasish Ghosh. What the author has accomplished with this stellar book is not for the faint of heart: It takes three strands—functional programming, reactive programming, and domain modeling—and manages to weave them into a tapestry of awesome. What captured me about this book is that it sets out on the rather bold mission of bringing together these three very different tools—domain-driven design, functional programming, and reactive principles—in a practical way. It teaches you how things like bounded contexts, domain events, functions, monads, applicatives, futures, actors, streaming, and CQRS can help keep complexity under control. Here is a link to the book’s accompanying code, available freely on Github. So if you are a fellow programmer who has bludgeoned their head through repeated, and dare I say, valiant attempts at grokking category theory, then you owe it to yourself to check out this splendid book. Don’t miss this book. 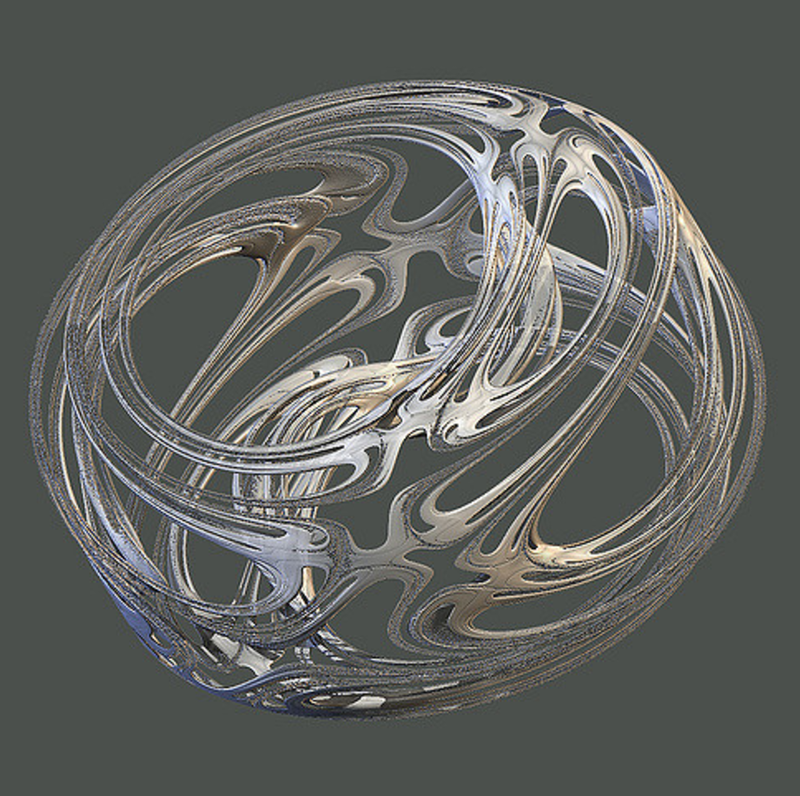 It’s like the GEB (Gödel, Escher, Bach: An Eternal Golden Braid) of programming in richness of content! I hasten to add that Scalaz is an awesome Scala library for functional programming. It is billed—very accurately, and modestly, so, if I may add—as providing ...purely functional data structures to complement those from the Scala standard library. It defines a set of foundational type classes (e.g. 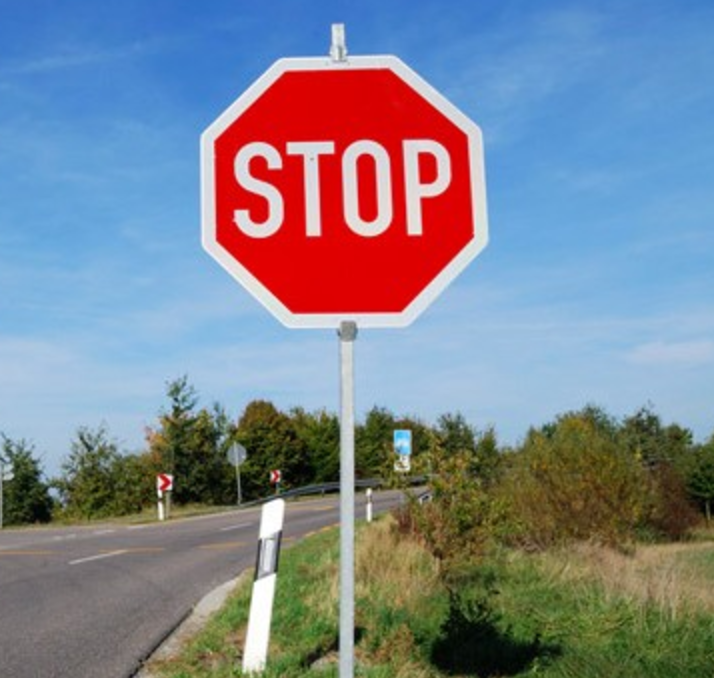 Functor, Monad) and corresponding instances for a large number of data structures. When reasoning on Request-Reply (209), what if you want your request receiver to reply to an actor at an address other than the direct message sender? Well, that’s the idea behind Return Address, as shown in Figure 6.5, and one that you can implement in a few different ways. That works, but it does require you to design the message protocol in a certain way. What if you have an existing message protocol and you later decide to redesign the existing receiving actor to delegate some message handling to one of its child actors? This might be the case if there is some complex processing to do for certain messages and you don’t want to heap too much responsibility on your original actor, for example the server. It would be nice if the server could create a child worker to handle a specific kind of complex message but design the worker to reply to the original client sender, not to the parent server. That would free the parent server to simply delegate to the child worker and allow the worker to react as if the server had done the work itself. Should the AccountingEnricherDispatcher Be Local? The purpose of actors is to model asynchronous processes by passing messages. 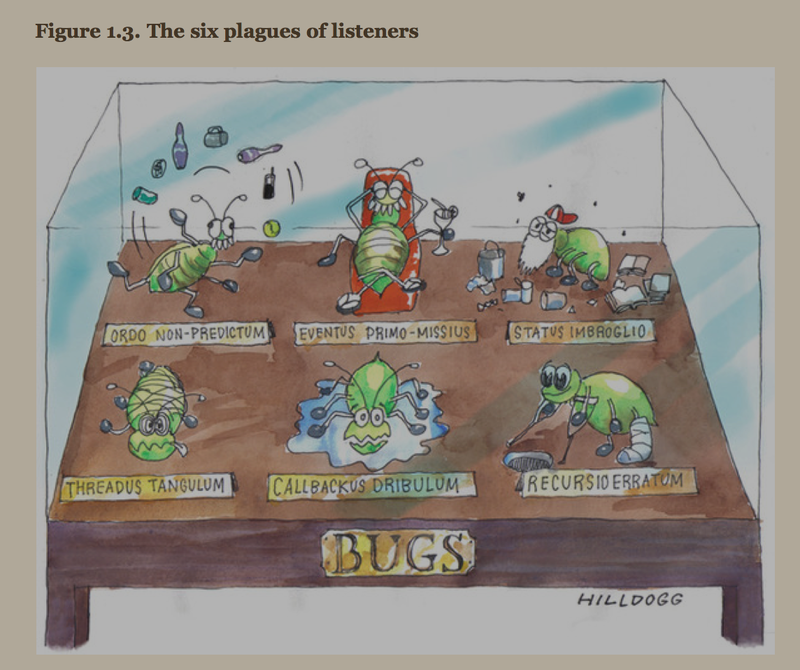 Like humans in an organizational structure, actors pass each other information and react to certain types of messages. Unlike humans, actors will only reply to the set of messages that are handled in their receive method. If no wildcard case has been defined, they’ll boldly ignore a message for which no reaction has been defined, without so much as a log message. (This behavior can be quite distressing when you’re getting started with actors, so it’s a good idea to log any unhandled messages.) As you can see, one of the most important tasks of building an actor system is getting the message protocol right. For a long time, writing asynchronous programs hasn’t been popular among developers because it can seem more difficult than writing good old synchronous programs. Instead of the ordered sequence of operations in a synchronous program, a request-handling procedure may end up being split into several pieces when written in an asynchronous fashion. …..There are dozens of articles about callback hell and even one domain name (http://callbackhell.com) dedicated to this issue, and it’s often encountered in larger Node.js (http://nodejs.org) applications. But writing asynchronous applications doesn’t need to be that hard. Chapter 1. Did you say reactive? 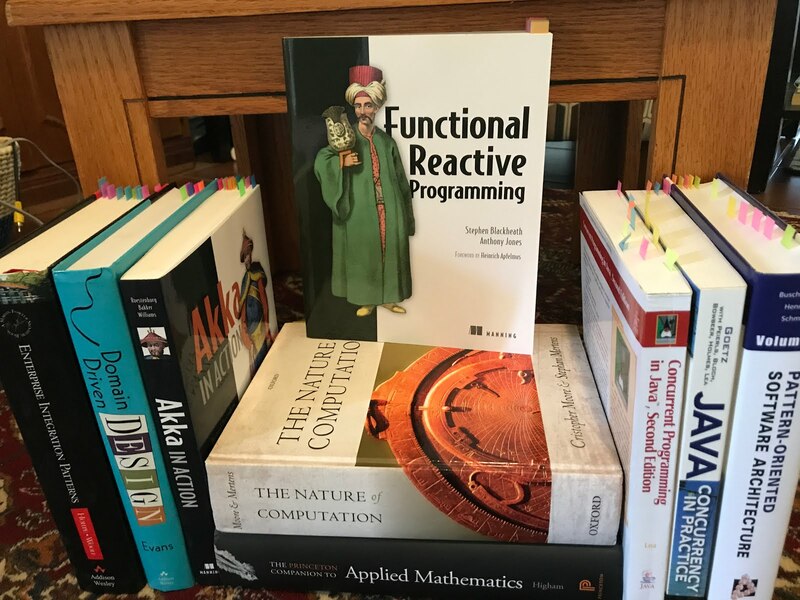 In the end, here is another fine book that is replete with novel ideas: Functional Reactive Programming by Stephen Blackheath and Anthony Jones (Manning Publications). It is a joy to read on many counts, not the least of which is the authors’ endearingly disarming humor and the skill with which they tell their story. It’s all stuff, no fluff! Today, building graphical user interfaces and using object-oriented languages have become mainstream. Unfortunately, though, programming user interfaces is still surprisingly difficult. 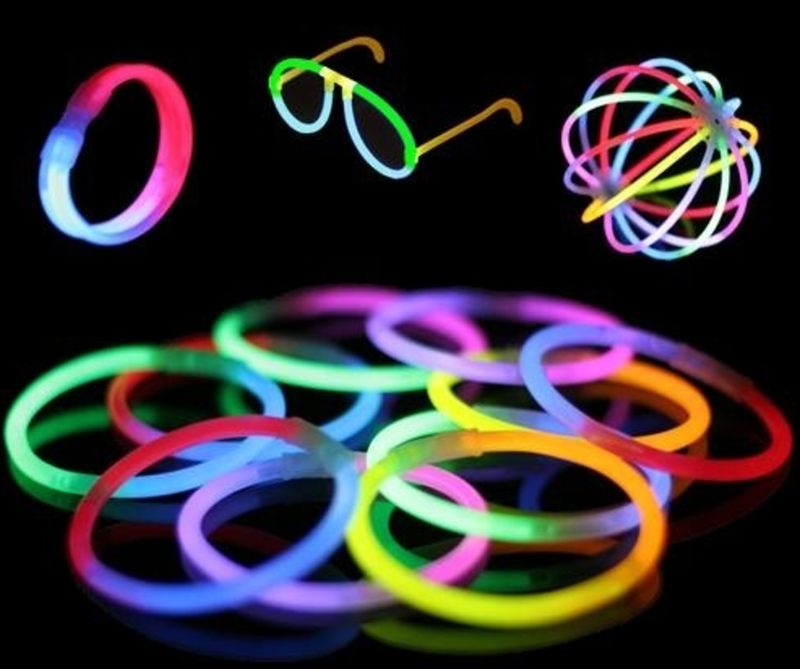 Code written in the currently predominant style, event-driven programming and the observer pattern, has an uncanny tendency to quickly evolve into an unmaintainable mess, commonly referred to as spaghetti code. Is there a better way? I think it’s time for another step in the evolution of user interfaces and programming languages. In recent years, the ideas of functional programming and a (separate) programming style called functional reactive programming (FRP) have shown great promise in making it easier to develop any kind of interactive programs. 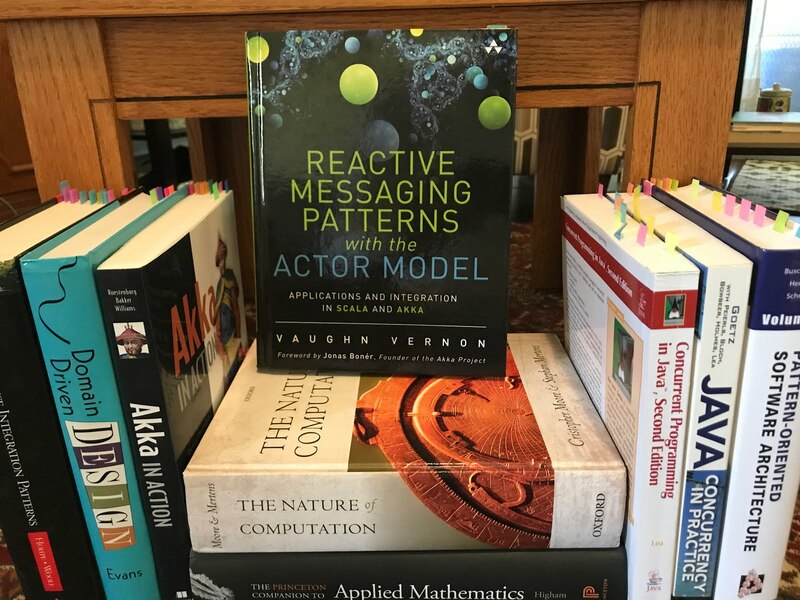 This text is one of the first comprehensive introductions to functional reactive programming in book form. If there is a blend of reads and writes on the bus, changing the code to separate these bus transactions into read phases and write phases can help performance. Note, however, that the order of read and write operations on the bus is not the same as it appears in the program. Bus latency for fetching a cache line of data can vary as a function of the access stride of data references. In general, bus latency will increase in response to increasing values of the stride of successive cache misses. Independently, bus latency will also increase as a function of increasing bus queue depths (the number of outstanding bus requests of a given transaction type). 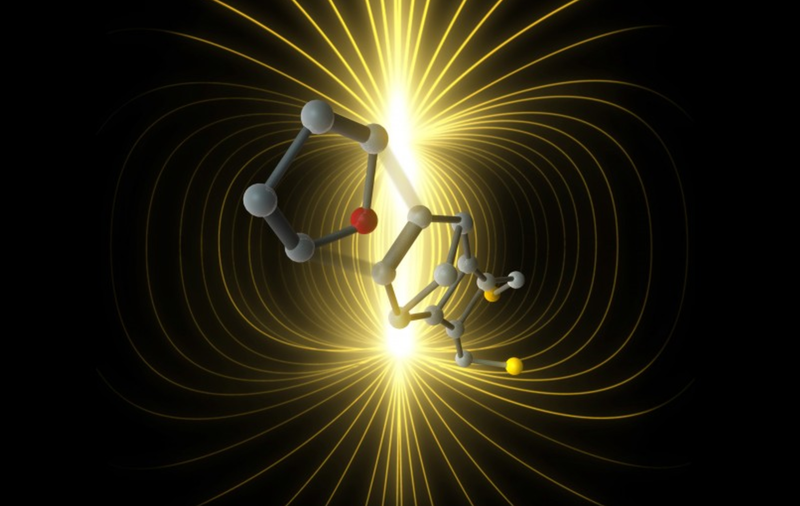 A major claim of FRP is that it tames complexity. It does this in a specific way: by enforcing something called compositionality. Software development is a form of engineering, and engineering is based on the philosophy of reductionism. This methodology is powerful; it has been enormously successful at providing us with technology that has transformed the way we do almost everything. 1. Start with a complex problem. 2. Break the problem into simpler parts. 3. Solve the parts. 4. Compose the parts of the solution into a whole. Step 4 is where we get into trouble. Reductionism has a hidden assumption of compositionality: that the nature of the parts doesn’t change when we compose them. When this isn’t true, we can fail badly. If we wrongly assume compositionality, then we have committed a logical fallacy called the fallacy of composition. 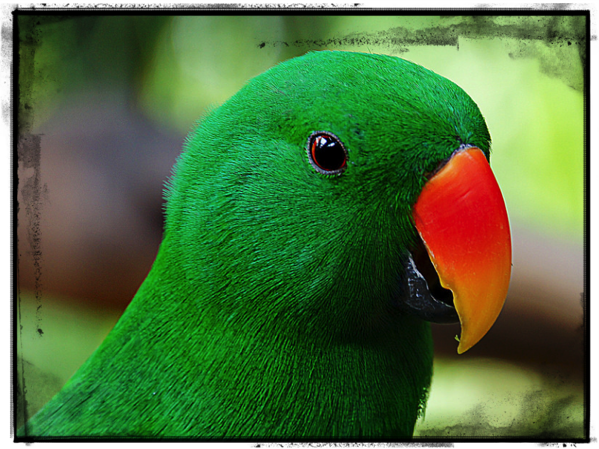 What is true of the parts in isolation may not be true when they’re combined. Wanted to transplant here, from the fine Scala Users Group (users.scala-lang.org), a good question by the reader Francososa, who had commented there on this post:- Thank you for pointing out these resources with reviews! As someone coming from Python I have two questions:- How do you recommend to get started on Reactive Programming? I'm going through Programming in Scala and Functional Programming in ScalaWill code in some of these books, like Reactive Web Applications, still work even if the libraries used are in newer versions. – I wanted to buy Reactive Web Applications but some of the comments indicated that the code wasn't working anymore because of the Play version it used.My reply was the following, which I wish to share here, as it may reach a larger audience:- In turn, I thank you, Francososa, for kindly appreciating my reviews of the finest books on Reactive Programming!It just so happens that I've spent a fair amount of time writing Python code, and found it to be an incredibly productive language. For most of my development work, however, I use Java and Scala since these languages are easier to maintain and scale well as your code base grows.- Having said, I applaud your enthusiasm for wanting to embrace the Reactive Programming paradigm. Both of the books you mention are superb. To those two, I would definitely add a third one, which you should read along with the fine book by Martin Odersky; the book FP in Scala is awesome, though a bit advanced. The book I'm suggesting is entitled Programming Scala: Scalability = Functional Programming + Objects (O'Reilly), by Dean Wampler and Alex Payne. As I had noted in my review of that book, many many moons ago, “If you're going to read only one book on Scala, make it this one…” and I still stand by my words. Feel free to checkout my musings on this very subject, to get a better sense of the resources available to you on Scala programming, by visiting my post on the “Best Scala Books”.- You're doing a very sensible thing by becoming proficient in Scala: Keep on reading!- To your second question, getting the versions of libraries all lined up, and working happily with each other, can be a challenge at time, in fact, more often than one would wish for it to be the case. I suggest that you visit the website each (where readers ask questions of the author(s) regarding the pragmatics, etc., of getting the accompanying code up and running) that is dedicated to the book whose code you're wanting to deploy and run locally. Manning Publishers do a great job, in general, of maintaining such archives, so please help benefit yourself by going through the archived threads (Q&A format). Good luck! Wanted to transplant here, from the fine Scala Users Group (users.scala-lang.org), another remarkably incisive question by the reader Yawar Amin, who had commented there on this post as follows:- Hi, thanks for the in-depth reviews. I should just point out that the last book, Functional Reactive Programming, is not like the others. It deals with reactive programming purely as a change propagation mechanism (in the same way that event listeners are used to propagate change). The other books all mean 'reactive programming' in the sense of 'building resilient, fault-tolerant systems' which is really quite something different and more akin to Erlang's actor model than to change propagation.In turn, my reply was the following, which I also wish to share here, as it may reach a larger audience:- Thanks for the spot-on comment, Yawar. 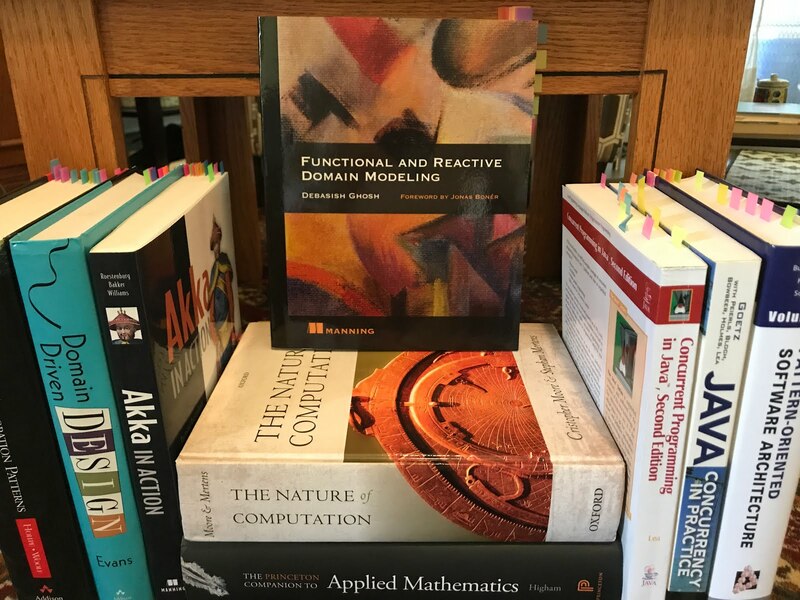 I can only wish that more readers would lavish the close attention (which you have clearly brought to bear) in reading my posts!- Yes, you are absolutely right when you point out that, “…the last book, Functional Reactive Programming, is not like the others. It deals with reactive programming purely as a change propagation mechanism (in the same way that event listeners are used to propagate change)”. I could not have said it better, so thank you, again, for clarifying.- I simply can't tell you just how gratifying it is when readers (like you) bring admirable perspicacity, provide feedback, and help everyone grow their understanding of these decidedly profound (and exciting!) subjects in the process. Kudos! – A big thanks to each one of you—to be precise, the 39,559 unique visitors—who made time out of their busy schedules to read my posted essays.- I leave you with a friendly reminder: Please don't be shy, we're all in this together – Freely share your reaction, thoughts, comments here! Positive site, where did u come up with the information on this posting signagecloud I have read a few of the articles on your website now, and I really like your style. Thanks a million and please keep up the effective work. I want to dive into reactive + functional programming and also akka. I have found your blog about recommended books very useful. I will be reading these books in the order you mentioned them. Congrats from Argentina and keep up the good work man!. I visited many web pages however the audio feature for audio songs existing at this website is genuinely excellent.